I am totally ahead of the “Christmas decorating train” with our apartment looking like a Christmas wonderland. 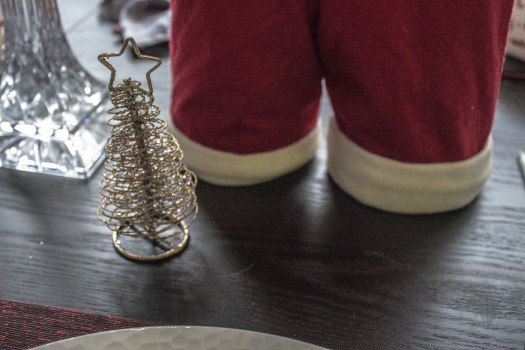 A little while ago, I did a post about having dinner with Kate Spade and figured this was the perfect opportunity to let you all in to my Christmas dining room table decor and how you can accomplish this on a budget! 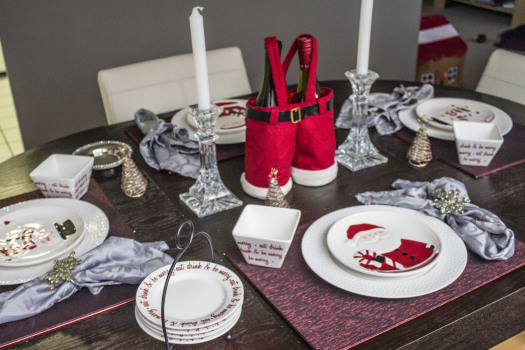 Just by dressing up your table you add decor to your home without having to go purchase a ton of cheesy tinsel! The key to saving money is using items that you already have. For the large dinner plates, I used the classic white ones that my husband and I use every day. There are only two of us in the house, so we make use of the extras. 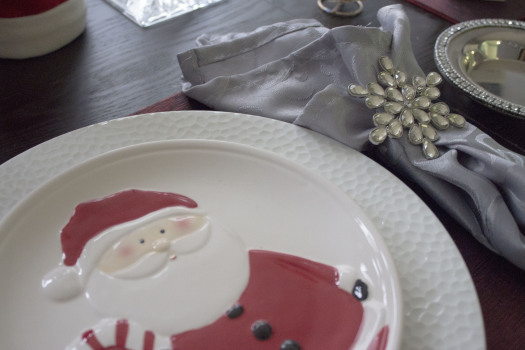 On top are my adorable Santa and Snowman plates my mother-in-law got us from the Loblaw’s home section! 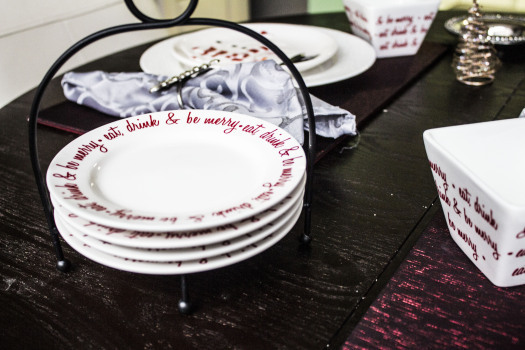 Four Christmas “salad or appetizer” plates on top of your everyday ones and you are already adding a little Christmas sparkle to your table! Oh I can’t forget, one of my favourite places to go, all year round. 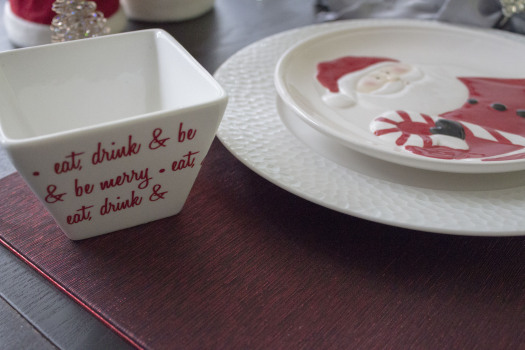 Homesense, was where I found the most adorable ‘Be Merry” bowls, which can be used for anything or even nothing. They are just too cute to not put out. 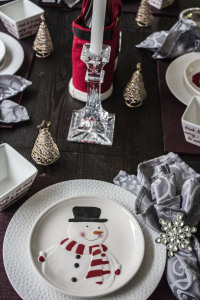 Along with the bowls are matching mini serving dishes for an added Christmas touch. I use the linen napkins that I use all year round because what colour screams more holiday than SILVER?! Lastly, is my obsession with napkin rings….honestly, it’s sick, so I got these adorable sparkly snowflake ones from Avon! Speaking of Avon, when I saw these gold Christmas Tree place card holders, I FREAKED OUT! There is something I love about sitting at a table that has a place card showing where you will be sitting. It makes me feel like I am at a fancy dinner party or something… I like the feeling of making myself think I am quite important J Use some white Bristol board from the dollar store for 50 cents and I can cut out little squares for each time someone is coming and we are hosting dinner! To some people place mats are place mats…. to me, they are the main focus when adding a little something to your table. This year at the William Ashley Warehouse Sale (if you haven’t been I am so sorry to hear that, I feel like once you go you will really understand life) I saw these glistening red and black rectangular lovelies! They are thick and easy wipe ones so when people miss their mouth they don’t get it on your table (GUILTY, if I ever get all my food in my mouth at a dinner, it’s a real miracle) you don’t freak out and have to immediately wash it off. 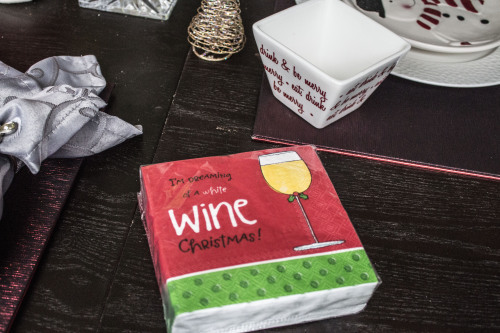 And remember nothing finishes off a dinner table like some clever napkins that will put a smile on everyone’s face!